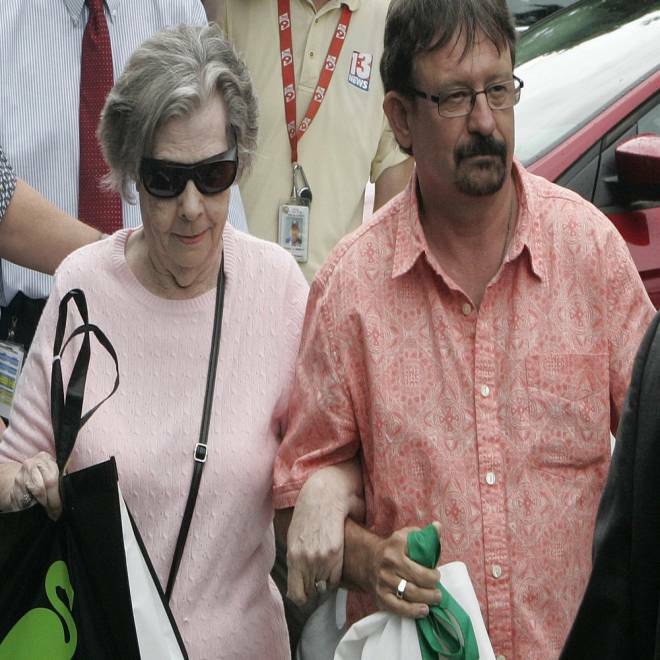 Powerball winner Gloria C. Mackenzie, 84, left, leaves the lottery office escorted by her son, Scott Mackenzie, after claiming a single lump-sum payment of about $370.9 million before taxes on June 5, in Tallahassee, Fla. When Gloria C. MacKenzie went to a Florida supermarket near Tampa last month to buy a Powerball ticket, another person in line did something nice for the 84-year-old widow. "While in line at Publix, another lottery player was kind enough to let me go ahead of them in line to purchase the winning Quick Pick ticket," she said in a statement Wednesday. The nice gesture turned out to be a life-changing one for MacKenzie and her family. She came forward Wednesday to claim the biggest undivided lottery jackpot in history, $590 million. A Florida woman believes she let the $590 million Powerball winner go ahead of her in the ticket purchasing line. WFLA's Peter Bernard reports. Those polite people in line with MacKenzie turn out to be Mindy Crandell and her 10-year-old daughter, fellow residents of Zephyrhills, Fla., WFTV reports. "It was our turn, and the lady turned and looked at me, and I said, 'Go ahead. You can get your ticket. No big deal,'" Crandell told WFTV. Crandell remembered the exchange in line when a friend texted her McKenzie's photo Wednesday. "'My daughter said, 'Mom, look, it's the lady that went in front of us,'" said Crandell. McKenzie is a retiree from Maine and a mother of four who lives in a modest, tin-roof house in Zephyrhills, where the lone winning ticket in the May 18 drawing was sold. She took her prize in a lump sum of just over $370 million. After federal taxes, she is getting about $278 million, lottery officials said. Wearing large sunglasses and dressed in a pink sweater and white pants, she clasped her son's arm after visiting the lottery offices as they made their way to a silver Ford Focus and left quickly. She did not speak to a crowd of reporters outside the building. She was accompanied at the lottery offices by two unidentified attorneys. MacKenzie bought the winning ticket at a Publix supermarket in the town of about 13,300, which is 30 miles northeast of Tampa. It is best known for the bottled spring water that bears its name — and now, for one of the biggest lottery winners of all time. The $590 million was the second-largest lottery jackpot in history, behind a $656 million Mega Millions prize in March 2012, but that sum was split, with three winning tickets. MacKenzie let the lottery computers generate the numbers at random. She said she had previously bought four other tickets for the drawing. "We are grateful with this blessing of winning the Florida Lottery Powerball jackpot," she said in a statement read by lottery officials. "We hope that everyone would give us the opportunity to maintain our privacy for our family's benefit." The winner had 60 days to claim the prize. Lottery spokesman David Bishop said MacKenzie, her lawyers and her financial adviser spent about two hours going through the necessary paperwork. After weeks of speculation, Gloria Mackenzie, an 84-year-old widow from Zephyrhills, Fla., stepped out of the Florida state lotto headquarters hundreds of millions of dollars richer. NBC's Katy Tur reports. "They had clearly been preparing for this. They took all this time to get everything in order," Bishop said. Minutes after the announcement, a dozen reporters in Zephyrhills were camped outside MacKenzie's gray duplex, which backs up to a dirt alley and is across from a cow pasture. Neighbors were surprised by her good fortune. "She didn't say anything about it. She's so quiet and secluded. She's usually in the house," said James Hill. "I'm very happy for her. It couldn't have happened to a nicer person. She was always pleasant and smiling." Another neighbor, Don Cecil, joked, "I hope she gets a better place to live." MacKenzie's neighbors offered few details about her life. They said she mostly kept to herself, but they'd seen her take short walks along the street and exchanged pleasantries with her. Her house, situated among mostly mobile homes and pre-fabricated houses, has a chain-link fence with a sheet-metal roof and an old TV antenna. MacKenzie retired to Zephyrhills more than a decade ago from rural Maine with her husband, Ralph, who died in 2005. Back in her hometown of East Millinocket, Maine, relatives and friends were surprised to hear of her good fortune. Robert MacKenzie, Ralph's brother, said the couple met just after World War II after Ralph got out of the Navy. He went to work in the town's paper mill, laboring as a technician for almost four decades. He said the couple raised four children in East Millinocket, a town of less than 2,000 people in northern Maine. A daughter and son still live in East Millinocket, another son lives in Florida and another daughter lives out of state, possibly in Massachusetts, he said. Robert MacKenzie said he didn't know his sister-in-law had won until a reporter called him. "Holy mackerel," he said when told of her winnings. He added: "It hasn't soaked in, but I'm happy for her. That would be great because she's a widow and she can have a nice home now." One of the MacKenzies' daughters, Melinda "Mindy" MacKenzie, a high school teacher, still lives in the family home in East Millinocket in a quiet middle-class neighborhood of white clapboard houses. Ralph MacKenzie enjoyed snowmobiling, hunting and fishing, said Andrew Hopkins, a retired high school teacher and assistant principal who taught some of the MacKenzie children. "They were good people. That's about all I can tell you," said Hopkins, who lives across the street. 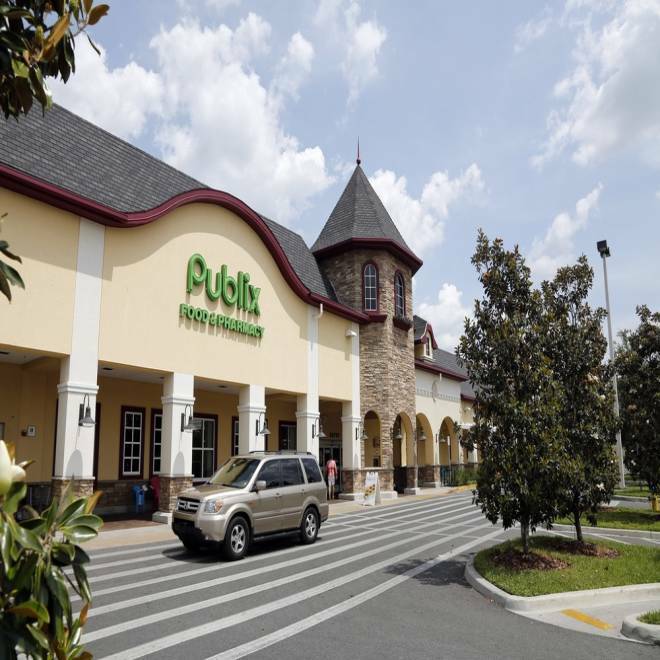 A Powerball jackpot ticket worth an estimated $590.5 million was sold at this Zephyrhills, Fla., Publix supermarket seen on May 19.